Something that often happens when walking to heel is that the dog gets a bit too excited and moves around like a bouncing ball – it walks a little too far ahead, jumps back, walks nicely a step or two, walks ahead a little too far, jumps back, and so on. It often jumps back when we stop or stomp our feet, because we have taught it that we will not move on until it walks in the right position. Often, the dog has also been rewarded for coming back – which is often good to reward the dog for but in the heelwork it often results in this bouncing ball effect. Therefore, be careful not to reward the dog when it bounces back, but only when it has walked one or two steps properly by your side. And ideally you should try to reward the before it bounces off again. It can also be more effective to turn around and walk the other way if the dog has too much anticipation on walking forward than to stop and wait for the dog to come back to your side again. 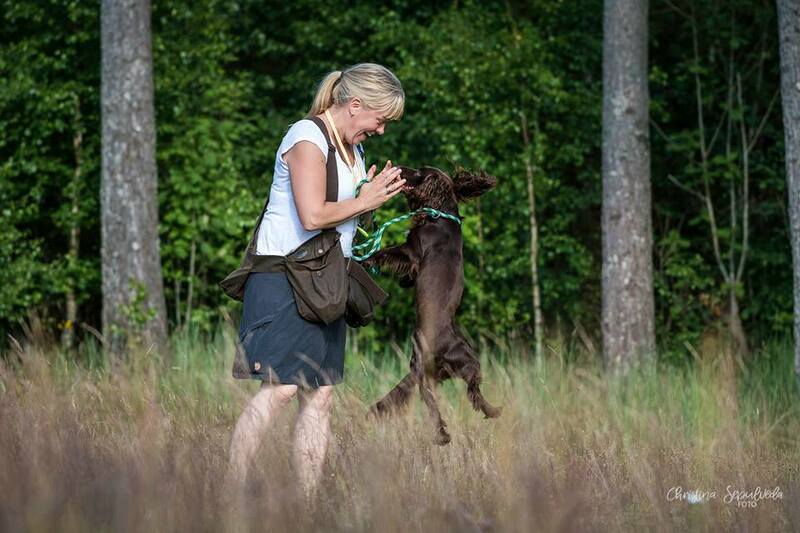 Bouncing in the heelwork gets the dog into an undesired feeling – since we want it to be calm and relaxed. Likewise, it’s the same with getting into heeling position. Don’t let the dog bounce into place, it is an unnecessary raising of its energy. Let it move calmly and collected, that way you’ll get off to a better start for your next exercise – whatever that might be. Think about what you do if the dog is in the wrong position. Does your dog have “bouncing ball” tendencies? When do you reward after it returns to the right position again? That is Piper! She is a big bouncing ball 🙂 Her heel work is improving, she tends to hang back, but she is getting there. Yesterday’s biggest break through was puppy deciding to walk next to me for over 100m with the odd treat. He was really calm and happy. I also walked to the fields on a loose lead with both the youngsters next to each other on lovely loose leads. They sat and waited for their leads to be taken off and then walked for 2 paces before I released them – any further and they would have gone…. we are getting there! Yes, bouncing here and there and everywhere, I can so relate to that! Great job! So happy to hear that it works so well!